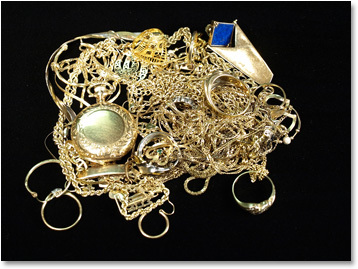 KC Coins is in the business of buying and selling gold and silver in the forms of bullion, and scrap (jewelry, scrap sterling and scrap gold). Bullion is the name given to precious metals that are bought and sold in bulk form. This is in contrast to those items traded as collectibles, such as gold and silver coins, however, gold and silver coins are often traded as bullion, depending upon the fineness of the precious metal they contain. A Canadian Silver Maple Leaf 1 ounce coin, for example, which is 999.9 pure (1000 being the highest fineness possible) is often traded at the current market price for silver NOT at the face valude of the coin ($ 5.00 CDN). 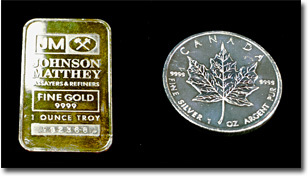 Other forms of bullion include bars, ingots, wafers and nuggets to name some of the most common. These items can range in mass from a few grams to 1,000 or more ounces. They will also have varying purities, but it's important to note that there is no such thing as 100% pure bullion. This is especially true of raw precious metals, but, many of the world's mints can very closely approach purity. The Royal Canadian Mint, for example, is renowned for it pure metal production. In addition to the amount and purity of the metal in minted bullion, you will also find that the mints of the world produce some very attractive bullion items, wafers and coins especially, that have highly detailed engravings, adding to their value as collectibles. It's important to note, however, that when it comes time to trade your bullion, the purity and weight of the item will ultimately determine your price. That being said, bullion from recognized mints − The Royal Canadian Mint, the Austrailian Perth Mint, or the Munze Osterreich (Austrian Mint), to name a few − are more easily traded, due to their recognized status, and will often fetch a better price than an unknown item. The main reason for this is that a dealer can easily identify the value of a Canadian Gold Maple Leaf coin, or an Austrian Mint wafer, for example, where as they will have to have an unknown bullion item evaluated (assayed) before giving you a price. This can take several weeks and the cost of the assay will be deducted from the purchase price. Bullion is often collected as an investment, and we certainly have seen a sharp rise in the price of gold and silver over the past year (2010 to early 2011). Many people turn to silver and gold as "risk" investments that, due to their intrinsic value, can act as a safe haven when paper currencies and stocks are in turmoil. But be warned − as with any other commodity, precious metal values can change in the blink of an eye and you must do your due diligence to ensure that you are not taking foolish risks. At KC Coins, we are the largest bullion dealer in Saskatchewan, and we offer the most competitive, local prices for gold and silver bullion. We are also a long-established, local business, that has been dealing in bullion and collectibles since 2000. While there are legitimate, mail-order or web-based businesses that deal in bullion, there are also many scam artists who are only interested in getting in, getting your bullion, and getting out. This is especially true when prices for gold and silver are rapidly moving higher and the media hype is on. Don't be fooled by extravagent claims and fancy marketing. We highly recommend that you work with someone you know, whether it be with us or with your own, local bullion dealer. Be wise and don't get burned! With gold prices rising to their highest levels in history, many people are seeing the odd bits of gold they have lying around as a treasure just waiting to be cashed in. 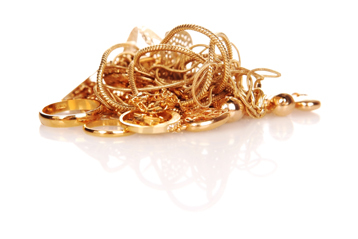 The most common type of scrap gold we buy is jewelry, such as broken chains, rings, single earings and so on. We also buy gold watches, medals, pins and even dental gold. We offer top dollar for your unwanted gold and silver jewelery. Prices paid depend upon the purity of the metal, not on it's value as jewelry, per se. Gold jewelry is normally hardened by alloying (mixing) the gold with a harder metal such as silver, copper or nickle. As gold is a relatively soft metal, the hardening process makes the jewelry more durable. The amount of gold versus the hardening alloy in any particular piece is defined by its "carat" value (spelled Karat in some countries). The higher the carat number, the more pure the precious metal used to make the jewelry. 24 carat is considered "pure", so why isn't it designated 1000 fine? The reason is that it's very difficult to achieve 100% purity in gold production. Even so, 999 parts out of 1000 is close enough, and is considered pure gold. Although fineness is a clear indicator of the purity of gold, it is a term more often used in reference to gold coins, bars, ingots, nuggets or other forms of bullion. It is also used when describing the purity of other precious metals such as silver.